Cradle your head with the soft comfort of these Cheer Collection pillows, available in sets of two or four. Crafted with a cotton cover and a polyester microfiber fill, the fluffy pillows give you all the benefit of traditional pillows without the maintenance. These medium firm pillows will conform to your neck, head, and shoulders for more restful sleep. I purchased a set of 2 of these pillows when also purchasing a down alternative comforter. These pillows stated that they are of medium firmness. I found them to not quite meet what I would consider to me a true medium firm. They were more towards the direction of soft firmness. They are definitely the most fluffy and soft pillows that I have ever owned but they do not provide the next support that was described. Other than them not being the firmness of medium as described, they truly are comfortable and VERY soft pillows. I will definitely use them for all purposes other than when support for my neck is needed! I am giving them 5 stars because of how soft and comfortable they are! The Cheer Collection Down Alternative Pillows (set of 4) were very, very soft and comfortable, but I thought the pillow would be fuller. These pillows are comfortable for side sleepers. The price is right. These Cheer Collection Down Alternative Pillows are the best! I love getting a set of 4 instead of 2, because they are that good. I am about to order some more! Great set of pillows. Very comfortable. The Cheer Collection Down Alternative Pillows are comfortable, soft, and I didn't wake up with any pain in my neck. They are affordable and a great value for 2 or more pillows. Very nice! I bought these pillows to fill the king shams of my new bed cover set. They work perfectly, fill out the shams well and hold their shape well. Very nice addition to my king bed. I bought these pillows to replace my husband's down pillows that were leaving feathers all over the place. He would never let me buy him anything other than down pillows - until now. Since we've had these pillows, he won't even touch the down pillows he was using. They do a great job imitating down pillows, but without the feather mess!!! I have even stolen one of his pillows and now prefer them over my old favorite pillows, as they are super comfy and don't leave me with a sore neck in the morning. Highly recommend to anyone who loves down pillows but doesn't love their mess!!! I really like these pillows. Traditionally I have purchased down pillows but due to allergies I decided to give these a try and they are just as good as traditional down pillows. Would definitely recommend them. Can’t wait to go to sleep after receiving my set of pillows today! The fact that four new pillows on my bed is just the beginning! These pillows are soft and not to firm that they have to be broke in before being comfortable to get a good nights sleep and not wake up with a sore neck. These pillows are absolutely wonderful! Soft, yet firm. Super comfortable for side sleepers. Just what I needed to replace old pillows. I love to read in bed, and 3 of these really fit the bill. Beautiful, silky pillows with great fluff but not too much. I love these pillows! So fluffy and down like but without the feathers sticking out. I can bend them in half and use them too! I will buy more for my other bedrooms. We slept on the new pillows last night and they were very comfortable. If you are a firm pillow person, these are not for you. But if you are like me and prefer soft as a cloud pillows, this is it! We had overnight guests coming and bought these pillows at the last minute. We are very happy with this purchase and highly recommend Them. Warning: super soft. At first I thought they’d be too soft, online they look much firmer so these were going to be the pillowsham decorative pillows,but they’re so comfy I’ll just sleep on them instead. Very comfortable pillows. They are soft but still provide enough support. I would highly recommend them! These pillows are dreamy; like sleeping on a cloud!!! Nice soft pillows. The only reason I gave it a 4 was they were a little too soft. Next time I will order the medium softness. 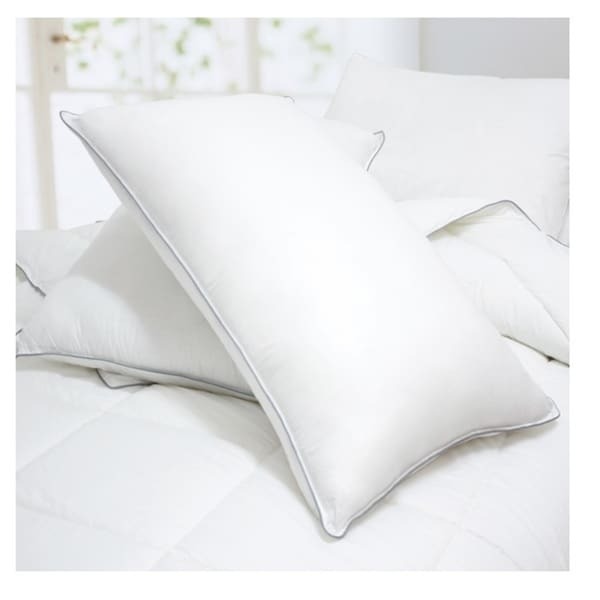 These pillows are a great value if you are searching for economical yet comfortable pillows! I purchased these for my daughter and her guests, and they are pleased with them. Great pillows! After months of use, still have good loft and have held up well. Bought originally for a guest room but upgraded my own pillows instead based on the good quality. Soft and comfortable but also offers a good amount of support. These are a bit too plush. I prefer a flatter pillow but they look nice with the bed when made. The price is great when changing out pillows every few years. Very Plush. The Cheer Collection Pillows live up to their word. They are Very Plush. I should have asked for "medium". Nevertheless, they are Extremely Soft, and are quite comfortable. "What are the dimensions of the king pillow?" King: 20 inches wide x 36 inches long with 40 ounces of fill. "The cover is made with cotton or polyester? The king size one has 40 ounces of fill - are they soft or firm? I mean 40 ounces is much!?" The fabric is polyester microfiber. The king size is larger in size and would need more fill. Hello mahasty, these are standard size pillows. Please let us know if you have additional questions. Thanks for shopping with us. Interested in a good down alternative pillow and the reviews were good. they are the best pillow I have ever slept on.